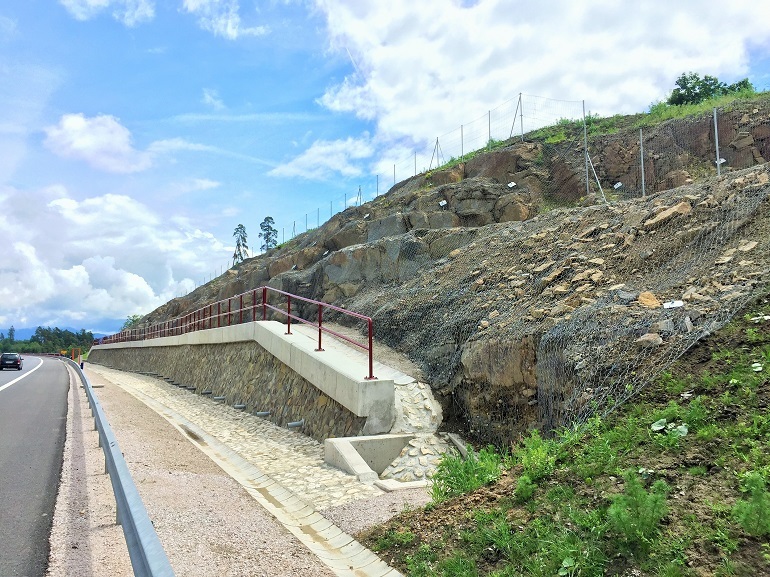 The combination of solutions including shotcrete, soil nailing and the rockfall protection netting system, Steelgrid HR30, provided the ideal stabilisation to a section of the D1 Janovce-Jablonov motorway at km 13,800-14,000. An engineered reinforced drapery system such as Steelgrid HR is the ideal rockfall solution for high rock faces and slopes or where large volumes of debris are expected. The upper part of the motorway cut has a 1:2 inclination and did not require any stabilisation measures. The central parts ‒ where the cut inclination varies from 1:1 to 2,5:1 ‒ are stabilized by means of rockfall protection netting. Steelgrid HR30 was selected as the most appropriate material, based on cost benefit analyses, speed of construction and mechanical characteristics. Steelgrid HR30 has been deployed in combination with steel nails Ø 22 mm, 2m long, evenly distributed over the face area with a spacing of 1 anchor / 4 m². The nails were installed perpendicular to the rock surface into holes and filled with cement grout. The lower part of motorway cut at an inclination of 3:1 was secured with C20/25 shotcrete with a thickness of 150 mm and reinforced with welded steel mesh 6/150×150 mm in combination with steel nails Ø 32 mm. Steelgrid HR is an innovative complete system for rockfall mitigation and slope consolidation works. The Steelgrid HR mesh is a composite of double twisted steel wire hexagonal mesh with high tensile strength steel cables woven into the mesh during the manufacturing process to form a single product. The end product is a series of full and half-hexagonal shaped mesh apertures.